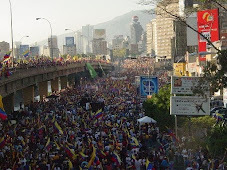 Last Tuesday in Caracas I crossed in Plaza Venezuela this Carnaval parade. Needless to say that my eyes popped out and that I am still looking for my fallen jaw. See, it is not that I am opposed to bring some politics into a Carnaval float, many of the samba schools of Rio constantly do veiled social commentary at the Sambodromo; but what is really bad here, is that politics kills any intention of escapism or folk art that is implicit in any Carnaval festivity. For two days you are supposed to drink, dance and be merry. This is not the time to proclaim all the alleged glories of a pseudo revolution. But chavismo cannot help itself: all must be for the glory of Chavez, or a reminder of his good deeds. 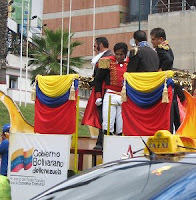 Tackiness, truly bad taste, imposition are all fine when Chavez is glorified. I suppose we cannot help it: there is dearth of intellectuals and well known artists supporting chavismo, and thus the cultural level of chavismo is so low that I should not be surprised. Yet, I am still surprised at the new lows regularly reached, and at tax payer expense by the way since all the cars used for that parade seem to have been official vehicles. The next picture is something I suppose from Venezuelan history. 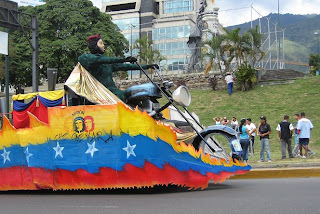 No more costumes of fairy queens, drag queens or Dairy Queens attendants here: Bolivarian drag only. And observe of course on the left lower corner the clear link to the "bolivarian government". No ambiguity here, on your face propaganda and historical manipulation, with as much red from the flag as possible. An even more direct intervention, though perhaps justified up to a point, was the float of the Tourism Ministry. But it also fails. The theme was the "Diablos de Yare". This could for the naive visitor seem Carnavalesque enough. But it is not. The Diablos de Yare is a very specific religious activity that takes place on Corpus Cristi, the now forgotten Christian holiday that usually takes place mid June. The masks and costumes have really deep meanings for the practitioners and deserve a little bit of respect. Showing it in such a circumstance is cheapening a very traditional Venezuelan celebration, one that attracts tourists from all around the world. But I suspect that chavistas do not have the cultural level to understand that, and since the Yare Costume is dominated by RED from immemorial times, well, then Yare must have been chavista before Chavez existed. And to crown all in chavista style, two more floats on medical matters. The first one is a reproduction of one of the modules of Barrio Adentro (the first time by the way I see one with the door open). Grotesquely it comes with its doctor in white lab coat. Human suffering brought to Carnaval parade. Pricelessly tacky. The second one is an insult to one's intelligence. 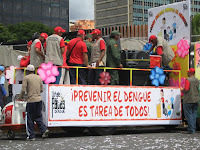 As the Dengue epidemic keeps growing in Venezuela and more deaths reported, the government of Caracas has nothing better to offer than a silly truck, loaded with bureaucrats in uniform and a billboard that says that Dengue prevention is everybody's work. Maybe, but since the governmental fumigations against the specific mosquito carrier have been woefully deficient, since the public hospitals are unable to face the emergency, since Chavez went as far as to say that the epidemic is from a modified form of the virus (genetically designed by you know who), it is simply pathetic to see the government waste resources on something were a message on how prevention is achieved is not even displayed. By the way, any float on the returning malaria and yellow fever? This is it, the cultural reach of chavismo, its mediocrity exposed in the most pathetic fashion. But then again Chavez is an uncouth soldier. What can you expect from a lout and the sycophants who he appoints? Where are the artistic masterpieces of Cuba's Castro or Nazi Germany? 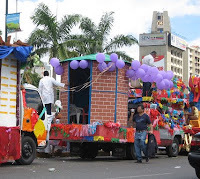 If you cannot even let the people manage Carnaval as they please, any creativity will be fast squelched.